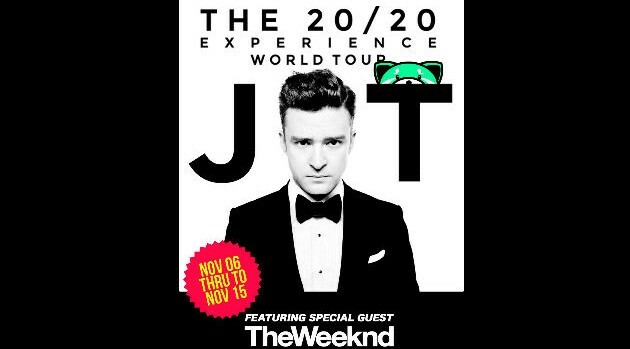 Courtesy of The Weeknd’s InstagramTo further support his Kiss Land LP, The Weeknd announced that he’s joining Justin Timberlake‘s The 20/20 Experience tour. The Canadian singer posted he dates he will share the stage with JT via his Instagram page. Beginning November 6 at Brooklyn’s Barclays Center, the crooner will rock with Timberlake in U.S. cities including Hartford, CT; East Rutherford, NJ; Philadelphia, PA; and Raleigh, NC; before wrapping up on November 15 at the Bridgestone Arena in Nashville, TN. After concluding his stint on the 20/20 trek, The Weeknd will play a four-night headlining stint from November 22 through November 26 in the U.K. He will have a couple of months off before hitting the road in February when he travels with Drake on the European leg of his Would You Like a Tour?